I'm so happy because my sweet little series of 6 cupcake greeting cards sold today! ALL of them to a customer in New Jersey. She was a first time Etsy customer & I am thrilled! YAY! 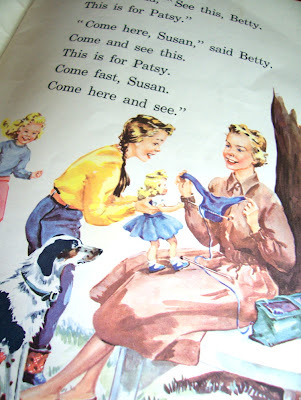 I'm eager to create some more greeting cards using the same vintage early reader children's book. I've also got a neato vintage Peter Pan book waiting to be made into something fantastic! 1. I mentioned that I stay up WAY late in my previous tag (in April), but I am a serious total night owl. I sometimes stay up until 2am. I love my alone time & doing what I want & this, sometimes, is my only time to get that! 2. I like kitties, but I don't have any pets. I do have a family with allergies. When I was younger I had an idea--because I liked kitties so much--to adopt a kitty, &amp;amp; then when it grew up to be a cat, I'd give it away & get another kitty & keep doing that so I'd always have kitties. Is that mean or what? You do realize I never went through with my plan & if I had attempted I'd only have been able to have one kitty, because I know I'd fall in love with a cat. 3. 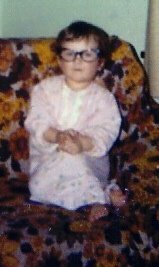 I was very shy growing up & would ALWAYS turn bright red at the littlest things! I got embarrassed very easy--even my ARMS would turn red! I pretty much just glowed. 4. I've always wanted to go on an African Safari. 5. I eat way too much ice cream. And my fave is anything chunky, nutty, & chocolatey! 8. I would love to live in a big city (with the peaceful country nearby) in a "flat" or studio apartment. My hubby & I have decided we will do this when our kids are grown & out of the house. Only 15 more years to go! Oh, & before I go---look what I got in the mail today!! 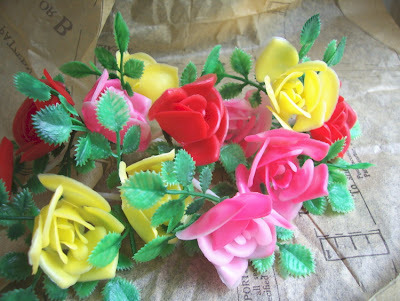 I ordered these awesome 12 kitschy plastic roses from A. Bel Emporium. She packaged them so nicely & they arrived wrapped in sewing pattern paper! Very sweet! My kinda girl. Aren't they going to look fabulousy cheesy & wonderful on top of some cupcakes?! Check out her shop--she has more of these & other cupcake decor!! Goodnight all! I'm off to my muchly anticipated once-a-month "scrapbooking night" with some lady friends, (even though I don't scrapbook!) But I'll be working on the "cute little mini banner" I mentioned in a previous post. I'm sure I'll have it ready to show off tomorrow!! **"Ugly Biz Card Contest" is still open for sign-ups until August 3rd!! Click HERE for the link & info!! We have 5 Etsy artists donating awesome prizes! And, 15 contestants so far! YAY! Oh..I'm such a night owl too...Or I guess you already knew that!lol..hmm I still get embarrased easy and I love strawberries! we have a bit in common..:) Oh and jaws freaked me out too! and I was in the Navy. wierd? Have fun at your scrap night! Aww, thanks for the shout out! 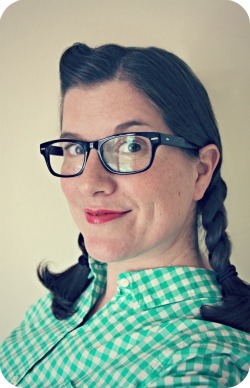 I'm loving you're blog! I'll definitely be back to visit! Great! I had to go over to the cupcake pick place & spend my hard earned money. It's all your fault! I swear, as fast as I make money on Etsy, I spend it! I love your kitschy plastic flowers!